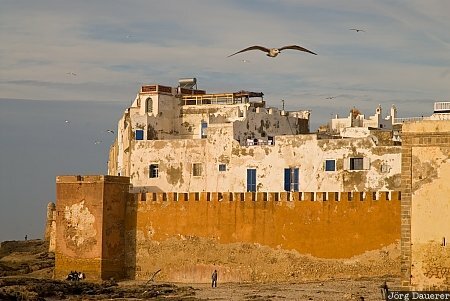 The wall surrounding Essaouira along the coast of the Atlantic Ocean with flying sea gulls in the sky is illuminated by warm evening light. Essaouira is in Marrakech-Tensift-Al Haouz in the southern part of Morocco. This photo was taken in the evening of a sunny day in February of 2010. This photo was the image of the month in October of 2011. This photo was taken with a digital camera.